This bass excerpt from Haydn's Symphony No. 45 in F sharp minor, H.1/45 has been edited by Lawrence Hurst, former principal bassist with the Dallas Symphony Orchestra and Professor and chair of the String Department at Indiana University School of Music since 1986. Hurst's bowings, fingerings and other editorial markings have been added throughout the score. Hadyn's Symphony No. 45 is also known as the "Farewell" Symphony and is illustrative of the composer's Sturm und Drang (storm and stress) period. From the turbulent first movement in F sharp minor (a highly unusual key to use at the time) to the rhythmically intense finale, the symphony both embraces and discards convention. The familiar sonata form appears as expected in the first movement, but it departs from the standard model in a number of ways (for example, introducing new material just before the recapitulation). The two inner movements suggest a sense of incompleteness or yearning for home, and the finale concludes with a long coda-like section, essentially a second slow movement, that is highly unusual in Classical symphonies. Download and print the score today to gain access to expertly edited Haydn Symphony No. 45 bass fingerings and bowings from Lawrence Hurst! 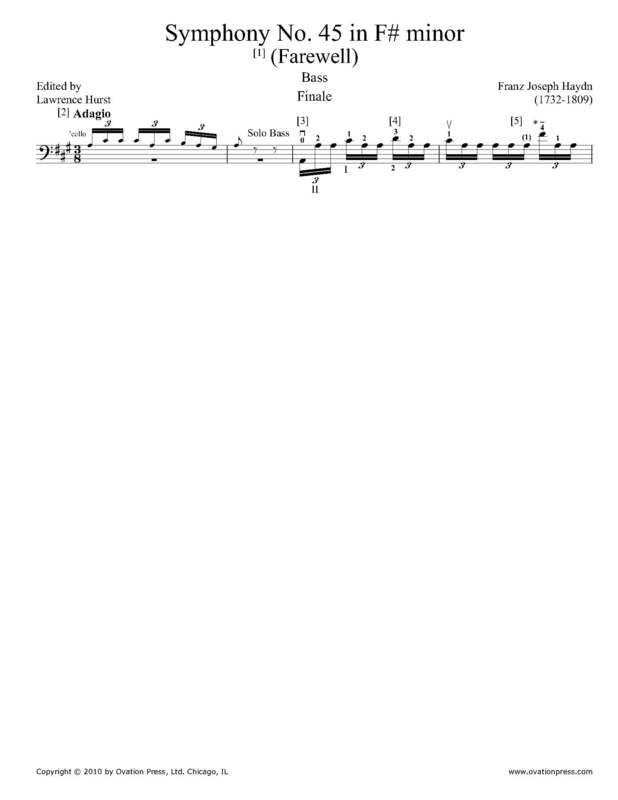 Please note: There are four lines of music encompassing the bass solo from the Finale accompanied by detailed comments and performance instructions. The subtitle “Farewell” for this symphony was earned through its use as an aural suggestion, of sorts, by Haydn, on behalf of the members of the court orchestra to his patron, Prince Nikolaus Esterhazy. Evidently the Prince had stayed at his summer residence at Eszterháza for many months past the normal time he usually returned to Eisenstadt for the winter season. This tardiness, of course, kept all the orchestra members away from their families and other duties in Eisenstadt. In the last movement, each member of the orchestra, one by one, departs the stage, symbolizing their urgent request to get back to their homes. This solo is edited in a comprehensive and detailed manner. Larry Hurst’s insightful performance suggestions are enclosed with this music.